For those of us who don't speak the native language of Iceland the name of this now famous volcano is daunting enough (ay-yah-FYAH-lah-yer-kuhl). This volcano awoke from an 187 year long slumber and began belching out lava, ash, and cinders on March 20, 2010 and has made headlines in the news because it brought airline travel in and out of Europe to a standstill. Early estimates put airline industry losses because of the 5-day long grounding at over $2 billion. Scientists had been regularly monitoring this volcano and detected significant deformation and seismicity (that's warping/bulging and tremors) in the 'belly of the beast' for several weeks before it began erupting. On March 20, the volcano came to life first spewing glowing lava fountains from a 500 meter long fissure in an ice-free area on the summit. It was a pretty tame eruption, much like the eruptions in Kilauea, Hawaii. 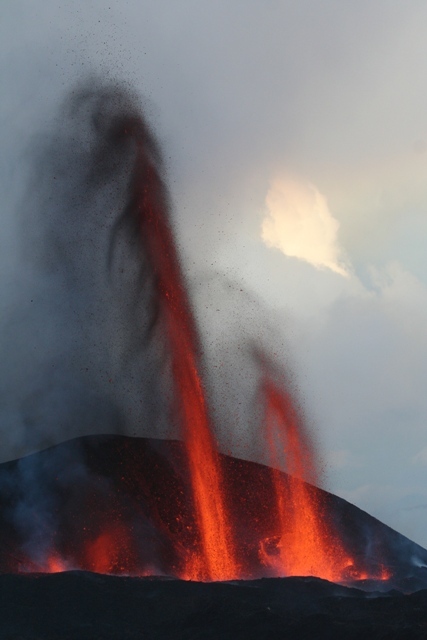 Then on April 14, the eruptions turned violent and explosive. A swarm of shallow earthquakes warned of the coming danger and the nearby villages were evacuated. At about midnight, a new set of craters opened up on the summit caldera underneath extremely thick layers of glacial ice, splitting the crust over the bulging magma and sending ash and steam as high as 11 km into the sky. Why was this eruption so powerful? Because of the presence of massive amounts of glacial ice; the intense heat from the molten lava upon contacting the glacial ice drove extremely rapid phase changes (from ice -> to liquid water -> to steam) that released tremendous energy, causing colossal volumes of ash to blow up into the stratosphere. Devastating lahars rushed down the slopes of the volcano, wiping out roads, buildings, and farmland in the valleys below. A lahar is a devastating phenomenon that is particular to volcanic eruptions that occur beneath enormous masses of ice and snow. The sudden, catastrophic melting of enormous volumes of ice and snow create a rapid landslide that is a combination of meltwater, mud and rock that moves at speeds up to 3000 cubic meters per second, destroying everything in its path. The eruptions continued at a stable rate, but the sudden change in wind on April 17 caused catastrophic effects on air travel in Northern Europe. The wind began blowing from the North, pushing the ash plume south, towards Europe. Icelandic volcanic eruptions have happened throughout recorded history, but the eruption of Eyjafjallajokull caused such widespread havoc because of the dispersal of the ash plume. An ash plume of this size happening 200 years ago would have had very little impact on humans, but because of the utter dependence on air travel for commerce, many people's lives were affected by destructive ash particles suspended in the "jet stream" that prevented them from traveling by air. Photographers have captured breathtaking photos of the Eyjafjallajokull volcano erupting at night during the first 72 hours that show incredible lightning strikes emanating from within the ash plume. It's a rare occurance, but the photos are proof that it does happen. What causes the spectacular lightning within the volcano's plume during the eruption? 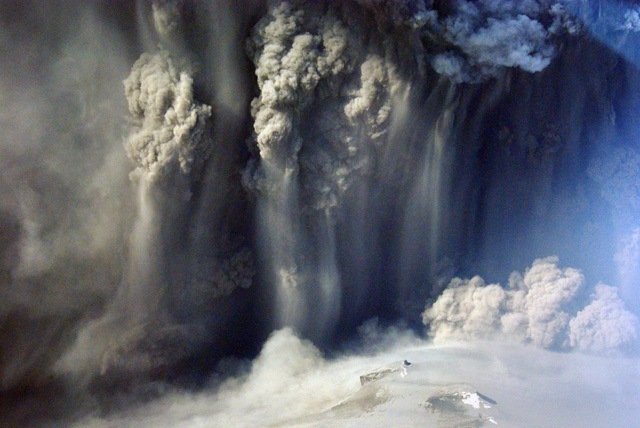 It's a complex interaction that results from a clash between volcanic ash and water. Volcanic ash isn't anything like the ash you might be familiar with that's leftover after burning a fire - the soft, fine particles that consist primarily of oxidized carbon molecules. The ash from an erupting volcano consists of tiny particles of exploded magma that's more like sand. It contains bits of minerals and volcanic glass, making it extremely abrasive, mildly corrosive, and it conducts electricity when wet. When you have a volcanic eruption that contains large amounts of water, as with Eyjafjallajokull, you not only have volcanic ash, but also lots of water in the form of steam. When the water vapor and ash particles move past each other at tremendous speed static electricity is generated. The discharge of the static electric buildup results in spectacular lightning displays. Scientists studying the eruption have suggested that the extensive spread of the volcanic ash happened for two reasons; 1) the very small size of the ash particles, and 2) the change in wind direction. By collecting and measuring samples of ash fall they determined that grains were small and light enough to be ejected very high (over 8km) up into the sky, where they were then subject to high winds. When the prevailing winds changed direction the ash plume was driven south and eastward towards northern Europe and into commercial airways. Just 20 km away from Eyjafjallajokull is another volcano, Katla, that has been showing increasing activity. Scientists are having some diffiulties with determining the source of the earth tremors from the Katla volcano and have speculated they may be due to the shifting of glacial ice. One of the largest glaciers in Iceland sits atop Katla, with ice 700 meters thick. But there is also a very good possibility that the seismic activity is due to the movement of magma inside the volcano. Volcanic eruptions have triggered eruptions in Iceland have triggered nearby volcanoes to erupt in the past and the Eyjafjallajokull and Katla volcanoes have a past history of erupting together. Scientists believe they are connected underground by a network of magma chambers. Scientists studying the volcano believe that another eruption, or an eruption from nearby Katla would not necessarily be as disruptive as this was. The fine size of the particles in the ash and the shift in the prevailing winds caused enormous volumes of ash to be carried higher and the wind direction blew the resulting plume south and eastward. An estimated 140 million m3 (cubic meters) of ash have been ejected during the 2010 eruptions of Eyjafjallajokull. Iceland is a volcanic island in the North Atlantic ocean. The island is one of the most volcanically active areas in the world because it is found along the northernmost part of the mid-Atlantic Ridge, which is the longest, unbroken mountain chain in the world. Over 40,000 km long, almost the entire mountain range runs along the Atlantic Ocean floor where it is not visible to us humans. However, Iceland is the only place where the volcanism that defines the mid-Atlantic Ridge is visible above sea level. Iceland sits astride two tectonic plate boundaries - the North American plate and the Eurasian plate - in what is known as a divergent (spreading) boundary. Here the tectonic plates are spreading apart and magma from beneath the oceanic crust is pushing upward and 'oozing' out of the cracks, or fissures, in the sea floor at a rate of about 2.5 cm per year. As the crust cools, new sea floor (oceanic crust) is formed. On Iceland, the volcanic activity has resulted in the building of an island that reaches above the sea. Iceland is continually growing larger as a result of the volcanic activity in this rift zone where earth's crust is cracking apart. Photos courtesy of the Icelandic Institute of Earth Sciences.